When Will We Reach The Bottom Of This Cycle? 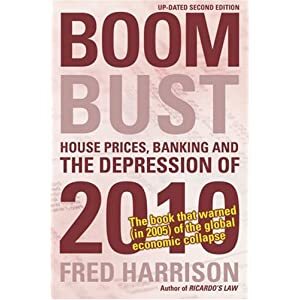 Some posters occasionally make reference to the 18 year property cycles which Fred Harrison has cited with reference to his past predictions. Not everyone is equally convinced of the predictability of these cycles, but I am sufficiently aware of the existence of business cycles to appreciate their value as a model for understanding behaviour in markets. When the hpi came to a halt in 2007 I could see we had reached the top and so Mrs STA and I decided that 2013-2014 was likely to be the earliest time to start looking to enter the market (to buy a home for our retirement) providing a couple of years to search out a suitable place in the right location at a reasonable price before the hpi started again. What has been different this time has been the government's intervention in the housing market; influencing the media to ramp hpi, lowering interest rates, using QE and measures to limit the number of repossessions. I appreciate the wider economic motivations for the government's actions (regardless of whether I agree with them), but it is only now the ConDems are in power that some of these policies appear to be unwinding and we may see the market allowed to correct itself. - The market might get out of control and HPC proceed more rapidly than government can support it and result in an earlier end to the cycle. I still think the second option is the most likely, but I would be interested in others' views on this and about the value/validity of Harrison's model of the property cycle. With a likely decade of negative interest rates, we could well see a halving of property in real terms although nominally property will only fall around 10-15%. The central banks are doing everything in their powers to maintain a slow regression to the mean and to do so in real terms over nominally. Also the 1990s were a decade of mostly falling or stagnant commodity and oil prices, i doubt this coming decade will be so benign. Whether that helps property by inducing an inflationary enviroment, or hinders it by squeezing income and forcing up rates remains to be seen. This is an important point. Commodity SECULAR trends last 15-25 years on average. Commodities peaked around 1981 and fell then until 2000. The new secular long term bull market in commodities commenced in 2000-01. So I reckon at leat another 5-10 year possibly more. The demand from 9 billion people over the next 25 years could mak this the longest commodity secular uptrend for some time. This part explains why commodity importers (Japan, UK, USA) had such a great 1980s-1990s and commodity exporters (Aus, NZ, Brazil, Africa, etc) had such a bad 1980-90s. On this basis of imported inflation together with huge debt, negative rates, the need to print leads me to conclude that we will have an inflationary decade leading to mostly real term property falls over a long period. I will buy when property gets to fair value. Possibly in 5 years time. The question is whether people are willing to wait to get to seriously 'undervalued' property prices. This could be a decade away unfortunately. Thanks for the responses. There seems to be a growing case for a protracted downturn which, if followed would break the 18 year property cycle. This could mean the scale of the present economic crisis could break a trend going back 150 years or more and which two world wars and two economic Depressions failed to do in that time. An indication of just how serious a mess we are in - or a sense of perspective perhaps? I do now accept (having taken a different view before) that we are likely to see the HPC measured in real falls rather than in mainly nominal falls; a consequence of the delay caused by government intervention and the BoE failure to target inflation over such a long period of time. In there he explains how he arrives at this...partly by observation and supposes that it is that particular length of time because of average life expectancy (time to pay back borrowed monies before one gasps) and average interest rates over the very long term. Observation I suppose is fair enough, but I can't accept at face value his reasoning for why it might be 18ish years and therefore I retain some scepticism. Clearly this leaves open the fact that if either of these factors alter (which they have), then the cycle duration should too. I have not read the book. I have read an article in Moneyweek which was distributed as a flyer in The Oldie magazine which summarised Harrison's general argument. I have also read threads on this site referring to it. However, the Property Cycle/Building cycle has been a point of academic discussion for a long time; I first came across this in the mid-1980s when I was reading about the building industry at that time; I also saw the late '80s HPC occur almost bang on cue! Seeing another cycle from start to finish (note Mrs STA and I bought our house almost at the bottom of the cycle in late '95) leaves me thinking there is something in the model; although I retain scepticism that it can be predictive without regard for other variables. You can't predict when we will reach the bottom too many variables and our great central bankers are doing all they can to prevent it from crashing. What's going to happen when is anyone's guess, my best suggestion is to get a tombola. You are right it will not be a crash per se.....it will be a long drawn out decline (in real terms of value)...when/if anyone buys will be depending on their individual circumstances.....but when and whatever they buy it will be for those that can afford it and are prepared to sit pretty living in it for a fair length of time....a house will be your home...but it won't be a money making short term investment. Real falls will have to be nominal falls if its going to make any difference to affordability for most. Unlike previous decades there is no real power base for workers to force their wages up, no unions to speak of, offshoring and immigration have taken care of that. Labour simply carried on with what Tories started back in the 80's and as sure as sh*t stinks, the Tories are not going to backtrack on any of these worker disempowering tactics. this last boom was very intense. It was fuelled by every mass media possible...and it went on a long long time. thinking back to 2000 when small houses first went over £100K, People would either rejoice or wonder how...I was in the wonder how camp. the How was the banking fraud which blew up 7 years later. the Rejoice was Loud and sustained...soon...200K was norm, and when you talked of house prices, well, 300 was just a word and a piece of pie..no problem whatsoever. No job?..buy 2 BTLs, no money down, get into business, then buy 20 more...the banking scam meant bankers had no risk, so you werent one, however bad at business you were....heres £1m. so now, what is the psychology of buyers....Wow...£170K mortgage for me, with combined income of £35K...hmm its a bit much, but look, we have gained £10,000 on our purchase 18 months ago....yes...lets go for it. this is why the fall is going to take a while....we've seen the bull trap already...and bankers are running out of funds ...and savers...well, if they see houses pulling away for a couple of months....well with low rates, they may well be tempted again by the cheapness as their "deposits" are falling behind again. this is going to be painful...but then again, Ive always said it would...Its a credit bust....and these are the worst and the hardest as VIs and bankers try their best to maintain their incomes at the expense of all else....and they have pretty much succeeded so far. And Governments find this difficult to fight...becuase a serious VI is their own empires, built during the credit boom...the Public Sector.